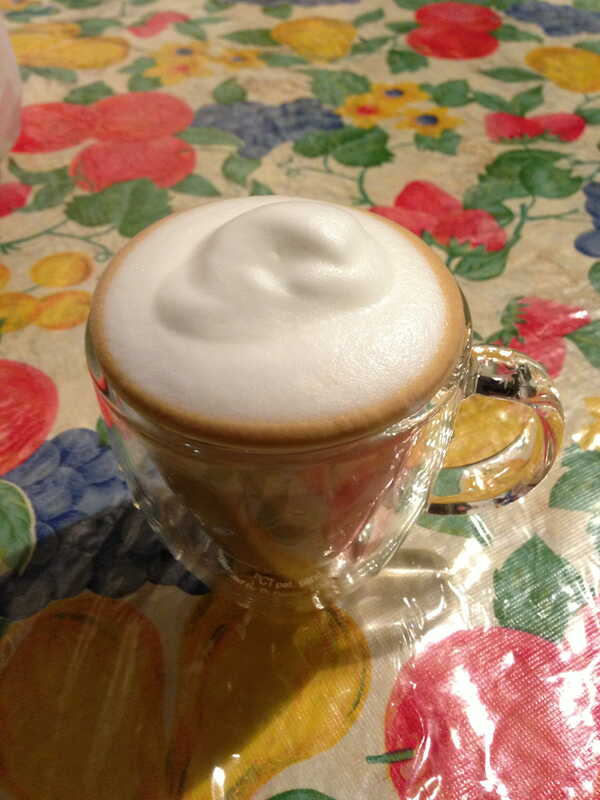 A pre-game cappuccino increases cognitive fluency in all things….thought invoking. Here’s a game filled with adversity, yet filled with courage. As a killbox scenario, I allow my opponent to go first. I want to see how he deploys. My thought is to counter-deploy to match my strengths against his weaknesses. I also control more models and so I spread my army over a longer length of the starting zone. Turn 1. Circle all clumped up in the center of the table…. lovely. 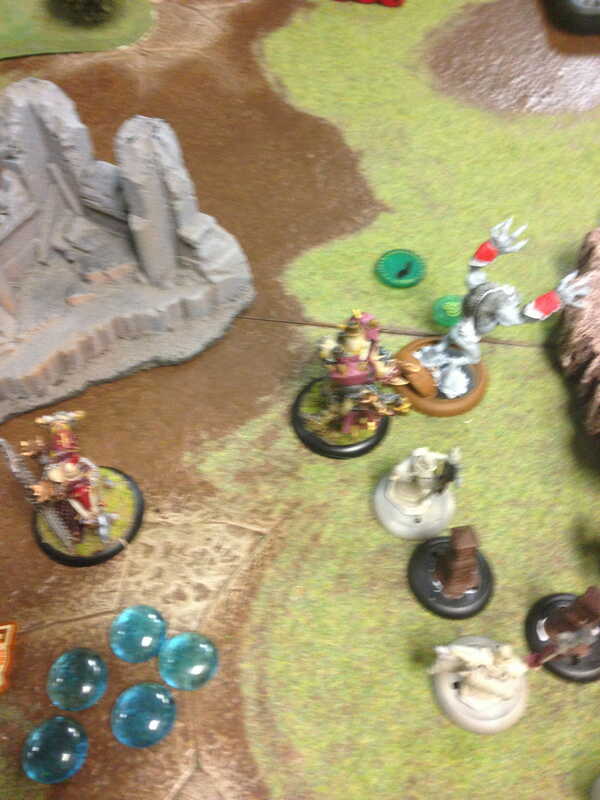 Menoth will squeeeeeeeze the spirit from the enemy. On turn 1 the entire circle army advances up the field. They have reached the center of the board, essentially. Menoth plods forward, slow as they are, and tries to position on the flanks. An errant takes a pot-shot at Laris and kills it with a decent dice roll. At the outset, I should mention to those wondering why I took the Vessel of Judgement battle engine with Reznik. They don’t jive well on paper, and perhaps the 9pts could have been spent better. Here’s my after-game thinking….I choose to take the battle engine because 1) it was painted, 2) I’d never played it before, and 3) I know that I would have to design a novel strategy around this meta. It might surprise my opponent, as well as provide me with new and fun opportunities to exploit. Turn 2. Circle takes advantage of their speedy war beasts. 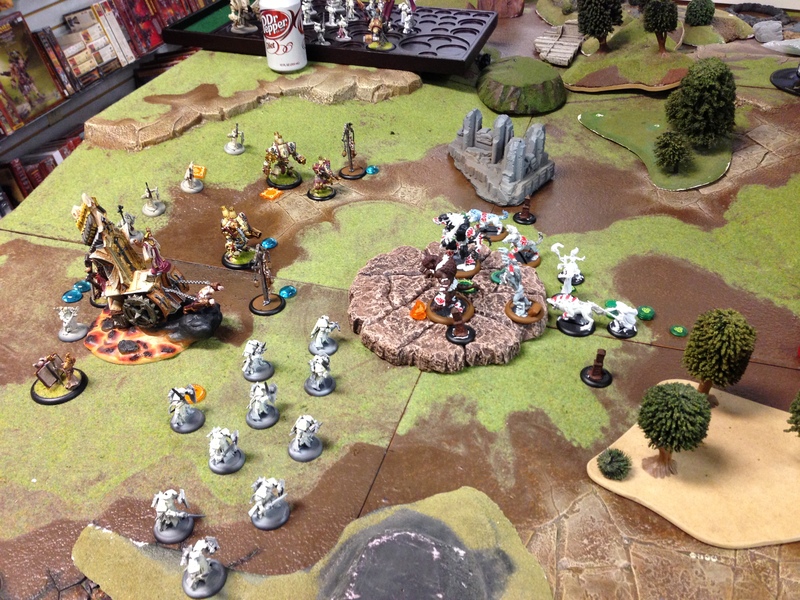 Menoth warjacks are about to take a beating….opportunities to exploit. Some of the best strategies emerge from experimentation. Where is the fun in playing lists that have been tested and tried over and over? Only in winning….a thrill that dies fast. So, anyway, as you’ll see, Shane is great opponent because he has a way of adapting quickly on a turn-by-turn basis. As you’ll see, he doesn’t lock himself into a set strategy, but drives forward based on the ever-developing situation on the table. While some call this impulsive, I say this is a virtuous talent. Maybe one I have yet to master. After all, was not Anakin Skywalker talented and impulsive, and did he not conquer the Empire? On turn 2, I’m well aware of Circle’s movement capabilities, hitting and running, etc. So I’m prepared to lose models to make a solid counter-attack. And so this happens, but the attack that Circle forces on my army happens to do a lot more damage that I expected. The Warpwolf Stalker gets some awesome dice rolls (with some buffs to strength) and I lose both my crusader and vanquisher in one-fell swoop. I had hoped to keep one of them for another turn. Other minor things happen with Circle. Maybe it was an error that I tried to bait with the Crusader, thinking the Vanquisher was safe…. I quickly put this thought behind me. 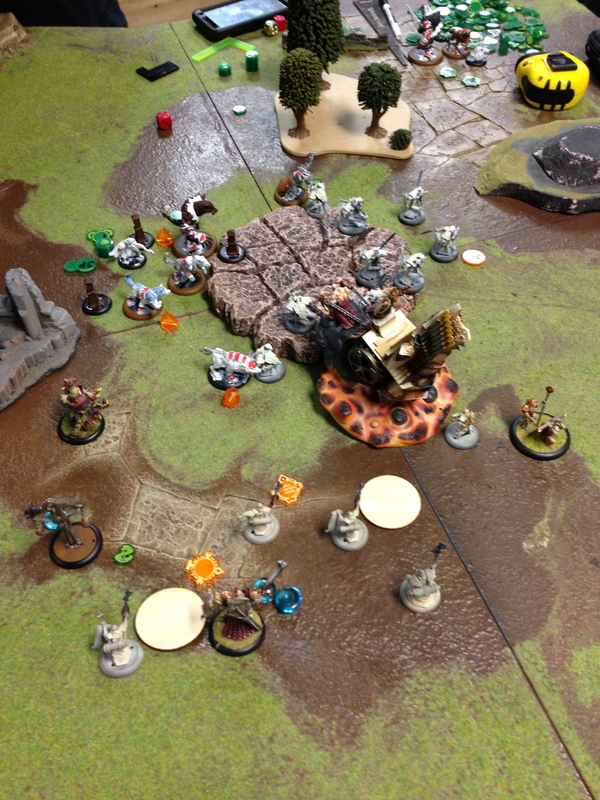 Menoth takes heavy losses, but continues to advance. Circle are regrouping…. Reznik charges and kills the Stalker with three swings of his sword, under the spell Engine of Destruction. He camps two focus and I know he is safe from retaliation. He’s got the best defense: distance. The Vessel of Judgement advances and shoots the Stone Keeper (most everything else is stealth with shadow pack). The exemplar errants continue with their right-side flanking maneuver, as planned. They charge in killing nothing, but engage a few models. Unfortunately, the left flank isn’t doing so well with the loss the ‘jacks. The repenter shakes-off the stationary effect placed by the winter argus attack previously. The repenter advances and sprays and kills the Druid Wilder and sets the argus on fire. Turn 3. At this point, my opponent mentions that he thinks he is in trouble. I’m a bit hopeful…. I can see why; despite my loss of two heavy warjacks I’m well positioned and still have many hard-hitting models left on the table within striking position of key pieces. For my opponent, he sees that he still has the model point advantage and the capability to pull off movement tactics to regain board control. We’re both walking on the edge of a knife. On Circle’s turn, the Warwolf does amazing damage to the Vessel of Judgement, kills it. My Errants fall to some sprays, but manage to put the hurt on many things. Reznik, the melee monster that he is, continues to advance to get within charge distance of the enemy warlock, Kaya. Reznik still has his feat and the opportunity to win the game is at hand. 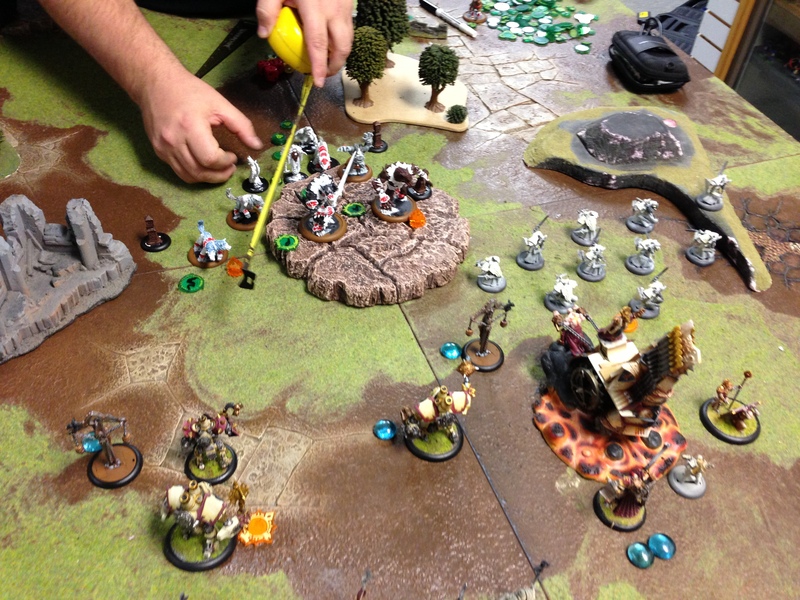 I move the Convenent of Menoth within command range of Kaya, the warlock. I did not move the full distance; I didn’t have to. In hindsight (20/20! ), I should have moved much closer to the Warlock. The Book uses Lawgiver’s Creed, whereby the enemy cannot cast spells while within 10″ of the model. I think this is enough to stop Kaya from using her spells to buff her Warbeasts for an assassination run on Reznik. On Circle’s turn, Gorax tries to slam the Repenter to knockdown Reznik. I did not see this coming! 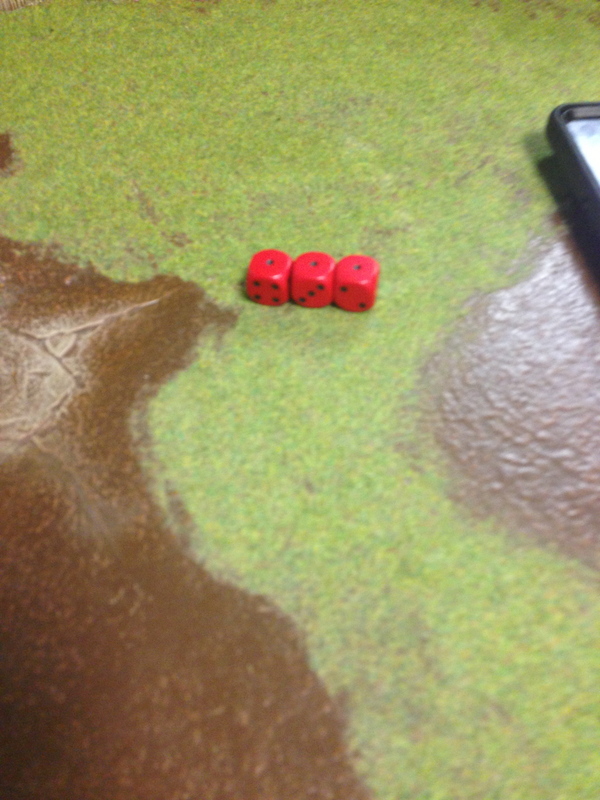 Fortunately, this slam power attack fails, epic triple ones, despite a boosted 3D6 roll. In exasperation, Circle continues with the attack. A bit shaken, Kaya moves back out of range of the “Book” just barely (if only I had moved the book further up to encompass Kaya’s movement so she couldn’t cast any spells). There was some movement wiggling, but it was absolutely outside the CMD of the book. Kaya just barely is able to cast a 6″ spell buff (primal) on his Warpwolf. This allows the Warpwolf the movement distance to get within melee with the still-standing Reznik. The Warpwolf promptly dispatches Reznik. Ugh….so close. Reznik was within charge distance of Kaya, easily. With the failed slam, it was Reznik’s game to win. Just a bit more thought on a critical activation using the “Book” would have made all the difference. This was a fantastic game of grit and nerve….Shane is a great opponent! Check out his cool blog at Jestor’s Mini Playhouse. Gorax attempts to slam the repenter into Reznik. Triple “ones” means the Gorax fails to connect his power attack against the repenter. Thanks again for the game! I stole that one! The spell I cast with Kaya on the last round was Primal, not Dog Pile. You have Witch Hunter so putting Dog Pile on your caster is silly! Primal gives a +2 to MAT and STR making the Warpwolf a MAT 9 POW 19. Thank you for the challenge! Yep, primal that was the spell. Wasn’t exactly sure. I’ll check out posting the blog at IABN for sure! Previous Post In the Bad Match-Up, Sometimes….